After an action-packed two days, nobody would fault Lauren Hurley for spending the three hour long bus ride back from the Morehead Invitational celebrating with teammates or even taking a nap. After all, she had just finished one of the most successful tournaments of her NKU career. Hurley broke the school record for digs in a match (31) and was named most valuable player in a tournament where her Norse went undefeated. Her performance at the tournament also netted her the honor of Horizon League Defensive Player of the Week. But instead of relaxing and sleeping, Hurley was putting in work; work for her very busy Monday. “Monday’s are my most difficult days. I am constantly going from 9:00am to 8:00pm,” said Hurley. Hurley is not your average student athlete. After getting her undergraduate degree in four years, and still having one year of athletic eligibility remaining, Hurley made the decision to apply and was accepted into Chase College of Law. When Kalin Holland, Hurley’s athletic advisor and a former college athlete himself, heard that Hurley was wanting to attend law school, he didn’t know what to think. “When she came back with law school, I was definitely surprised and shocked,” Holland said. Holland had never worked directly with a student athlete who was wanting to attend law school, but he had talked to other students and friends who have attended and graduated from Chase. They said that solely being a student in law school was challenging enough. “A good friend of mine who graduated from Chase years ago said it’s difficult, it’s very demanding,” Holland said. Although not traditionally viewed as short at 5’5”, Hurley plays a sport where seeing a woman who is 6’2” or taller standing across the net is a fairly common occurrence. This is why head coach Liz Hart believes Hurley has the tools necessary to tackle the challenge of law school and volleyball. Holland has seen the same type of determination and character throughout her academic career at NKU. “She never never backs down and one of the things about her is she doesn’t rattle,” Holland said. “ Nothing gets her out of her mindset and she is pretty balanced.”. When this question was posed to Hurley, her response was a little different. Hurley admitted, openly, that with the time that homework and class prep demands, it does make it more challenging to always be focused on volleyball. However, she feels that law school has helped her maintain and even improve as an athlete because it is making her grow as a person and a student. 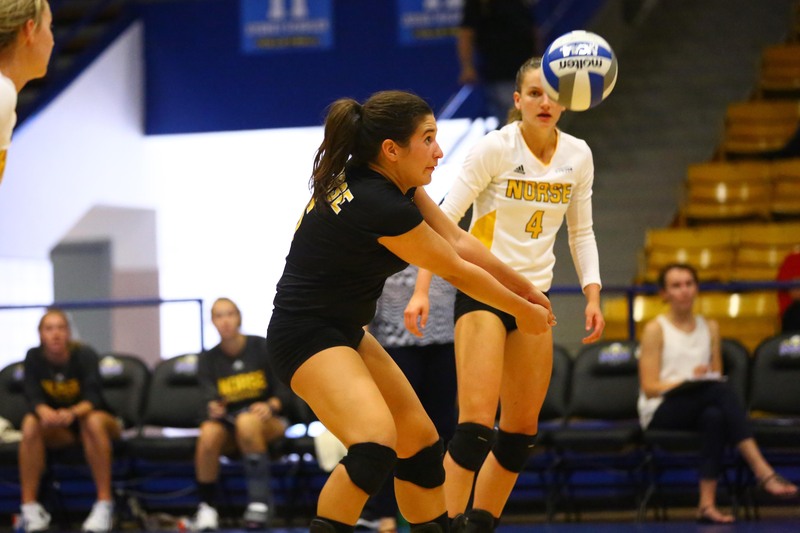 Hurley leads the Norse in digs with 221 digs so far this season. of being on the volleyball team; something that Hurley doesn’t take for granted. 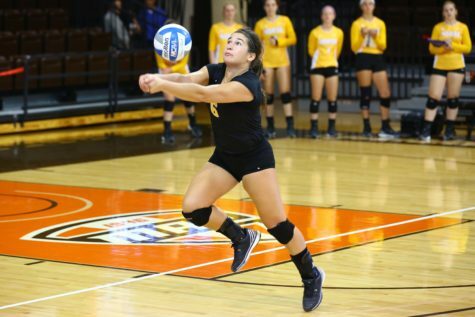 “I know that what I’ll miss most about being a volleyball player is the friendships and camaraderie that I have with my teammates and just a lot of the other athletes,” Hurley said. Admittedly, Hurley doesn’t have everything figured out yet. She knows that being in law school is right for her, but she doesn’t yet know what specific focus she wants to take as it relates to getting a law degree. As a result, she also isn’t totally sure what type of job she ideally would like to land after law school either. However, Hurley has learned a few things from her time so far as a student athlete. She’s also learned that having friends is a necessity. Even though she doesn’t have too much of a social life right now, she credits her teammates for encouraging her as an athlete, but also as a student. “Me and my roommate will go to the library together and we help each other study and stay focused,” Hurley said. Hurley might not have all of life’s questions answered right now, but she is taking on a challenge that few others would choose to accept.